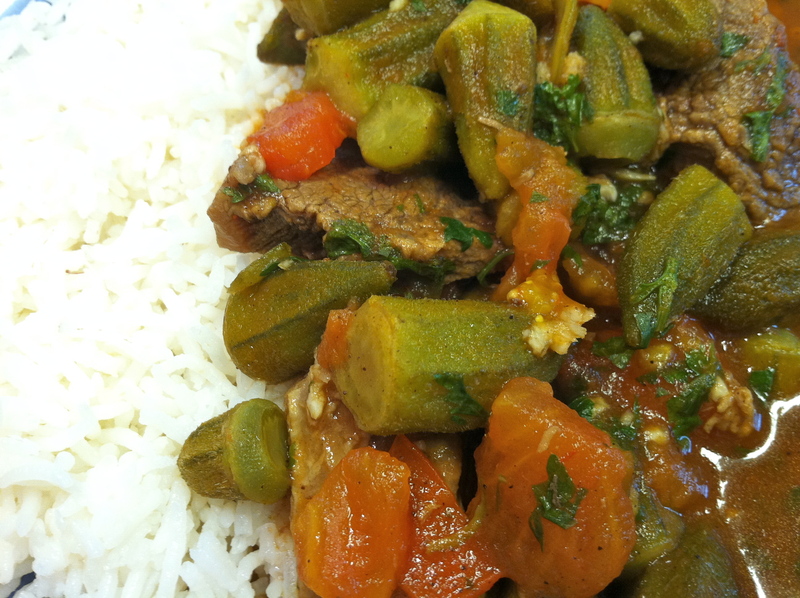 Nora shares a traditional and tasty family recipe for okra stew, known in Syria as “Bamiyeh”. First, cook the beef. Add some olive oil into a pot, and then add 1.5 lbs of beef cubes. Add one tablespoon of salt. Add 1 teaspoon of allspice. Cover with enough water to cover the meat with two inches. Put on stove, and let cook for 45 minutes (30 minutes with pressure cooker). Roughly chop three tomatoes, rough chop one cup of fresh cilantro, and mash six large garlic cloves. Place these in separate bowls and set to the side. Add a little olive oil into a new pan, and heat it up. Add two 14 oz bags of small okra. Add one 6 oz can of tomato paste. Add the chopped tomatoes. Add one tablespoon of salt. Add two teaspoons of allspice. Mix together, and then add the cooked beef, and add enough stock to cover the top. Simmer for 20 minutes, without the cover on. In the last five minutes of simmering, add the chopped cilantro and mashed garlic. Mix together. 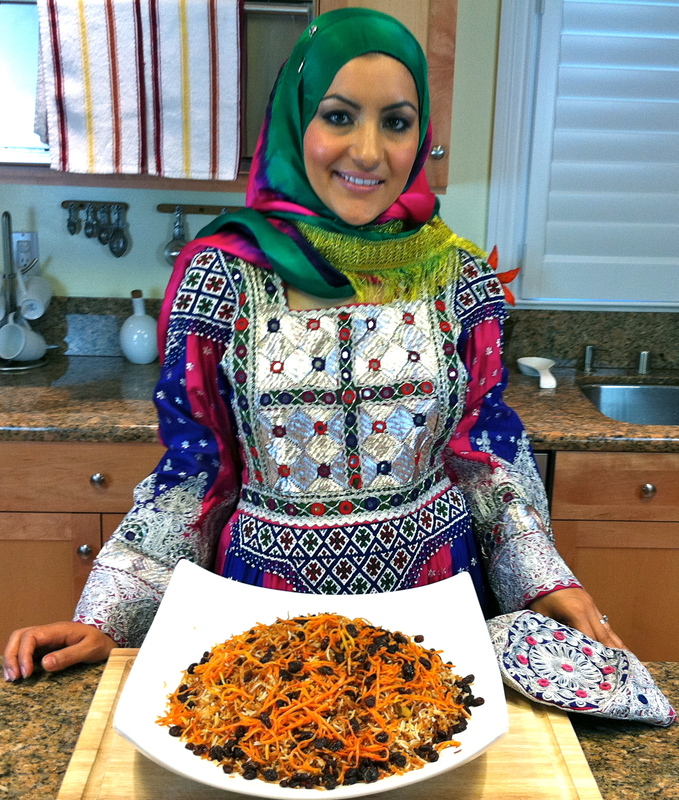 Hatifa shares a recipe for Kabli Pulao handed down to her by her mother. This dish is a complete meal in and of itself – tender beef piled between layers of sugar sweetened rice and topped with a fragrant mixture of carrots and raisins. A dinner party pleaser – this well-known Afghan staple will dress up any table! One pound of beef with bone. Add one small sliced onion fried in oil. Add 1/2 tsp. of turmeric powder. Cook for about two minutes. Add two to three cloves of chopped garlic and cook for an additional two minutes. Add one tsp. of coriander, four cups of water, and cook in a pressure cooker for about 30 minutes. Pre-soak the rice for 2-3 hours before cooking. Boil water and add salt to taste. Add four cups of white basmati rice (long grain) to halfway-cook for 15-20 minutes. Stir every few minutes. Turn off the heat and drain the water. Cook two cups of sliced carrots in a pan with one cup of vegetable oil on medium-high heat for about 5 minutes. Add 1/2 cup of red raisins for about two minutes and add 1/4 tsp. of cardamom. 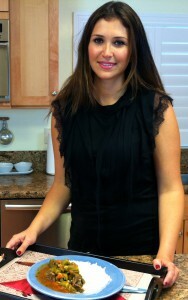 Remove from pan and place onto paper towel to remove excess oil, then place in an aluminum foil wrap to close it up. Add one cup of vegetable oil to a pan on medium-high and 3/4 cup of sugar. This process burns the sugar, takes about 5-8 minutes. Pour the cooked sugar onto the cooked rice. Mix and shape the rice into a little dome at the bottom. Add ground cumin, sprinkle on top. Add 1/2 cup of water. Place the foil-wrapped raisins and carrots to the side, inside the pot with rice. Place lid onto pot so that steam stays inside the pot. Keep on high heat for 5 minutes, then reduce to medium for about 20 minutes. Once cooked, place onto platter. Add the cooked meat in the center of the rice. Cover the meat with the rest of the rice. 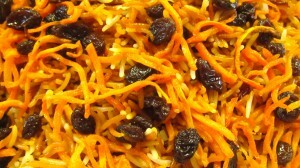 Add the steamed raisin and carrot mixture to the top.